Espadrilles have come to be one of the chicest shoe styles for men during the spring and summer months and as the sun is now shining through the thick fluffy clouds, it is time to store away the brogues and dust off your espadrilles. Our 'Muse of the Month', Francoise Gilot was no stranger to espadrilles and she probably had the task of tidying them all up around the house after Picasso. My question is though, how did this style of shoe become so popular with so many iconic men? Espadrilles first made an appearance in the Spanish Pyrenees during the 14th century being a common form of footwear for peasants but these simple slip ons were destined to be a lot more than peasant shoes. One company that propelled these shoes into the world of fashion was 'Castaner', a family run company set up by Rafael Castaner in 1776. Isabel and Lorenzo Castaner met Yves Saint Laurent during the early 1960's leaving YSL so captivated by these 'peasant shoes' that he made his own versions. From the 60's onwards, with thanks to the Castaner family and YSL, espadrilles became synonymous with the laid back glamour of the Mediterranean being worn by artists such as Picasso and Dali. 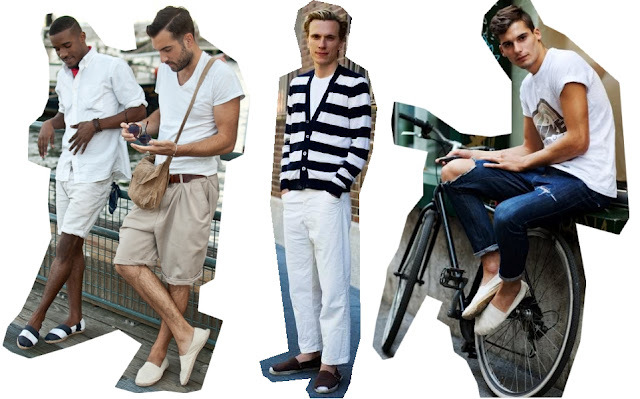 Today, espadrilles are still a popular choice for men and as you can see in the picture above, there are endless ways for them to be worn in a smart and fashionable way. My favourite brand for espadrilles has to be Soludos, an American brand whose ethos is steeped in the care free, spontaneous fun of long summer days.Their vast range of espadrilles for men are perfect for days at the beach, relaxing on rooftops or sightseeing in unknown cities and the array of bright, bold colours is a guaranteed mood booster. This summer, Soludos have showcased a collection inspired by centuries of Mediterranean living so you too can dress like Picasso or if Surrealism is more your scene, you can sport their 'Dali' range of espadrilles. Here are my favourites from the collection, all available to purchase here. those kind of shoes are so cool!